The first half of my trip was spent in Germany and one of the first things I did there was attend a birthday party in a castle. Yep, a castle. It was pretty neat. The surroundings were lovely and so was the food. 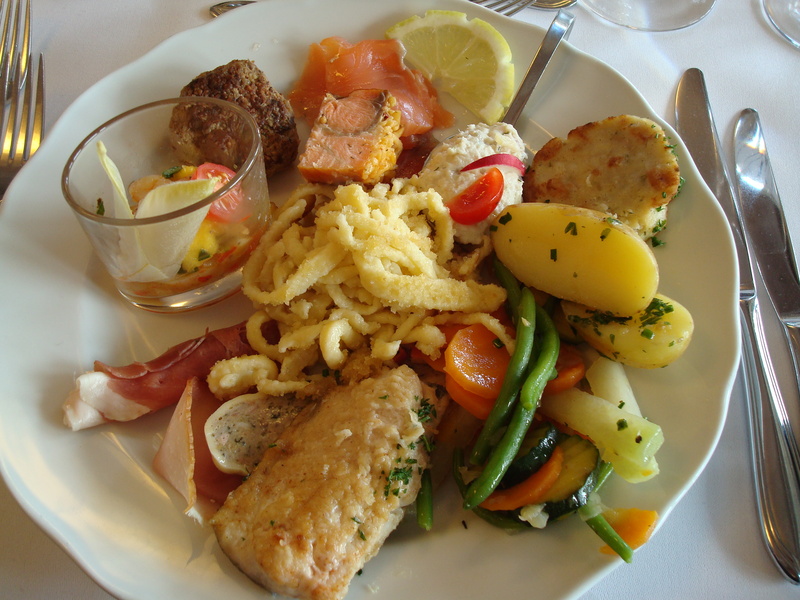 Below is the main course which consisted of spaetzle (ah-mazing), fingerling potatoes, roasted vegetables, shrimp cocktail, smoked salmon, some sort of smoked fish pate, meatballs, fish cake, baked fish, and thinly sliced cured meat. There was also a venison stew, several kinds of German potato salad, cabbage and carrot salads, and probably a few other things I am forgetting but I wanted to save room for dessert so I showed a little restraint. 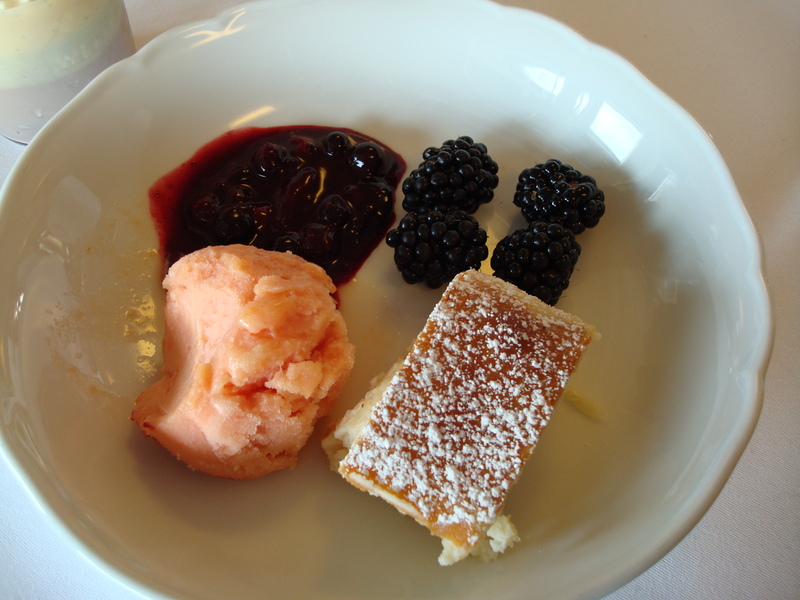 After the main course the waiters brought out dessert which was lovely and light: strudel, fresh fruit, pudding, and sorbet. There was actually a second dessert later after coffee and cappucinos that consisted of various pies and cakes but I was way too full to partake. Probably should have eaten less spaetzle… I couldn’t help it though– it was just too good! I realized upon returning home that I had taken approximately 35 photos of food, 20 of landscapes, and 3 of family. Oops. Do my dad’s hands in the background of the below picture count as another family photo? Guess I got 4 of family then. 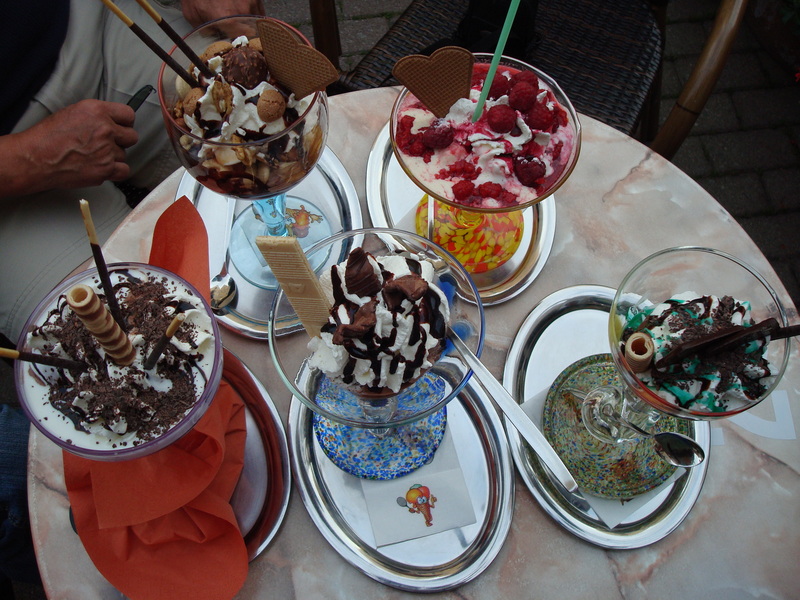 The above were some very lovely, very tasty sundaes we ate at an Italian gelateria in Germany. Apparently the family that runs the place do such a booming business during the warmer months that they return to Italy and relax during the off-season. Sounds like a pretty sweet deal. Pun intended. Later in the week I will be posting pictures of a food market I visited in Stuttgart. The selection and presentation were incredible! Those sundaes look absolutely amazing. I may or may not have just tried to lick my computer screen!